This day has been a long time coming and I am SO EXCITED to finally share my first video with you guys! Disclaimer: please go easy on me haha, I am not used to shooting video!! YouTube is another part of the blogosphere I have wanted to add to my content for a really long time, and I’m fortunate that my brother, Jacob, is a videographer and photographer – so he has been kind enough to bear with me as I dip my feet into this new space. Ps. I may or may not have had a few mimosas prior to shooting to calm my nerves…ha! (You’ll want to watch until the very end – it’s pretty funny!). 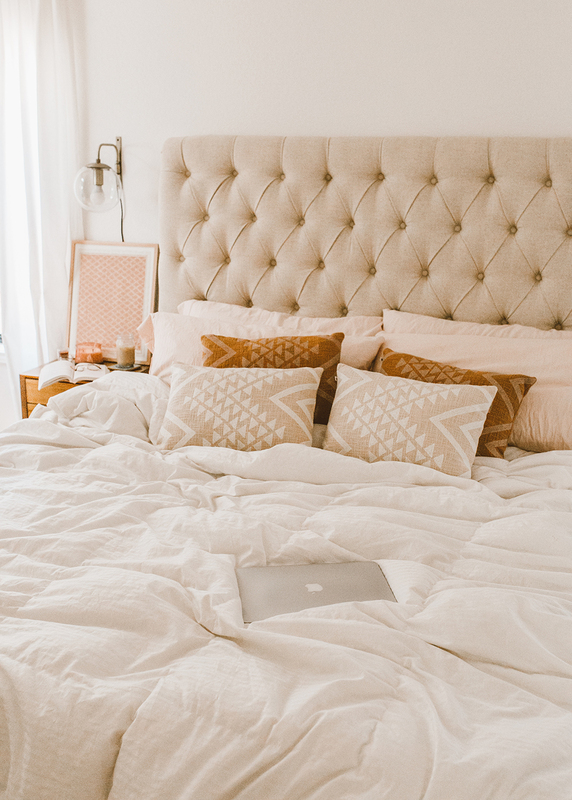 I don’t know about you, but jumping into an ultra cozy bed sounds like the most amazing thing ever right about now. This week was a straight up d-o-o-z-y and I am very much looking forward to some quality lounge time…and you can find me riiiight there in that spot above, being slobbered on by Watson and with a giant cheesy grin on my face! 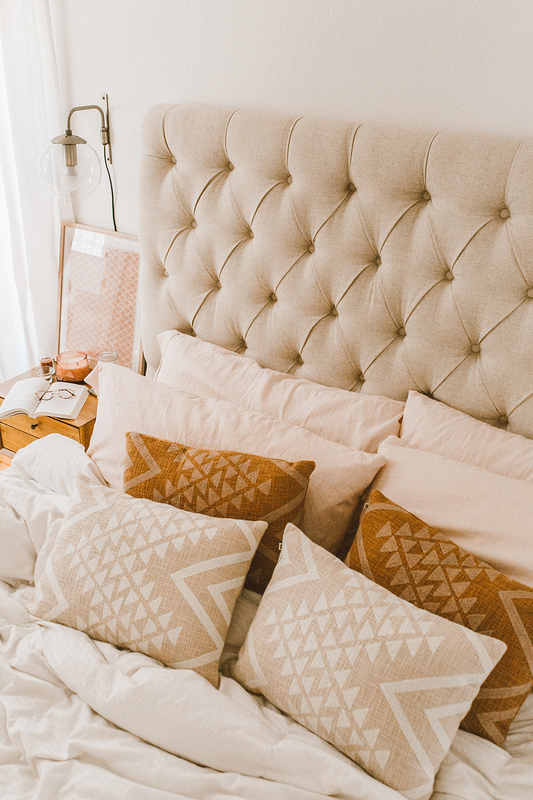 If you follow me on Instagram, you probably know that Blake and I recently updated our bedroom a bit – we switched to a king size bed and swapped out our old lamps (…although beloved!) 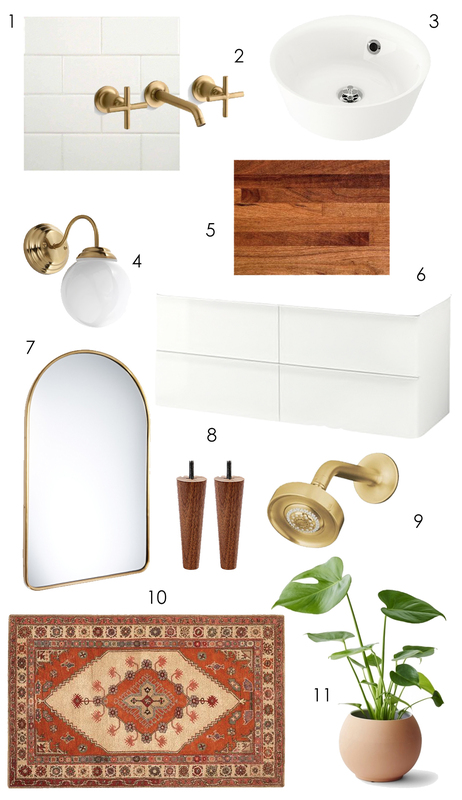 for some bronze wall sconces (swoon!). I feel like such a grownup with the sconces haha. It’s almost like I should be reading the newspaper instead of scouring gossip websites (god bless you JustJared…you’ve kept me entertained for yeaaaars)…but nahh, I’ll stick to my ‘ol reliables! 😉 In addition to the headboard, lighting and sheets, we topped off the space with THE most beautiful lumbar pillows. 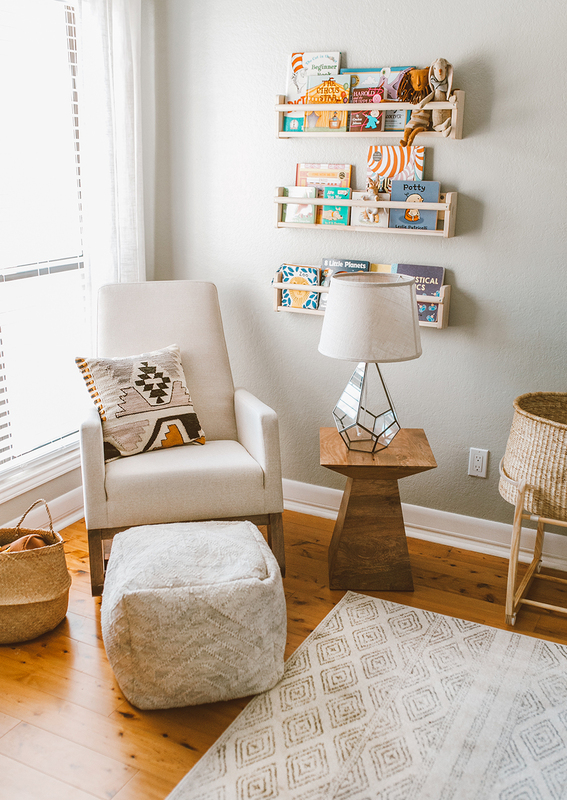 Our rug has hints of orange throughout, so I thought opting for a mix of orange and cream pillows would be really pretty and soft…without adding more pink to the room (…thinking of Blake with this one, ha!). 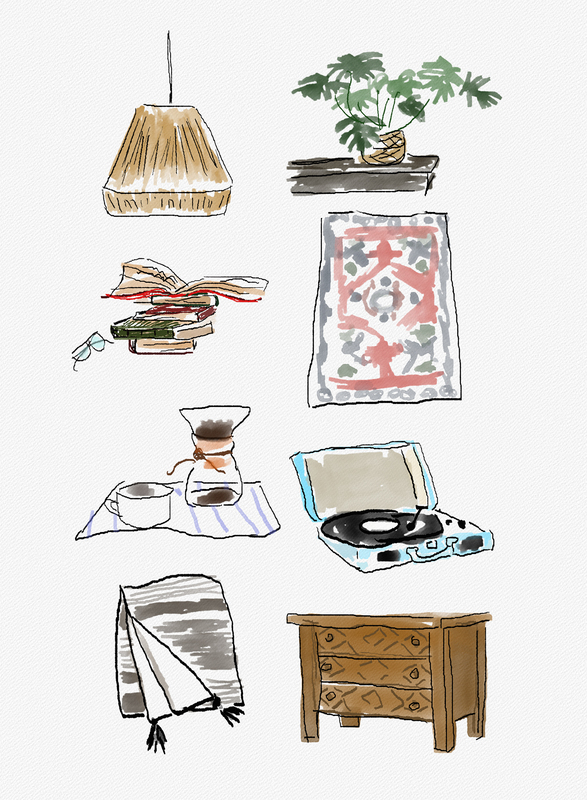 We also added a couple of seat cushions to our living room area (more on that further into this post…). Excited to share it all with y’all! 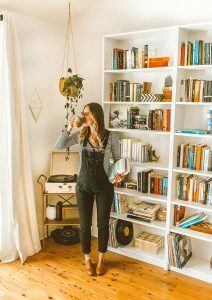 If there’s one feeling I have come to love (like really…LOVE), it’s the feeling of a completed room. (You know…that moment when you get to look at all your hard work and take a big, deep breath of relief as you grin from ear to ear…that’s the feeling I’m referring to…). 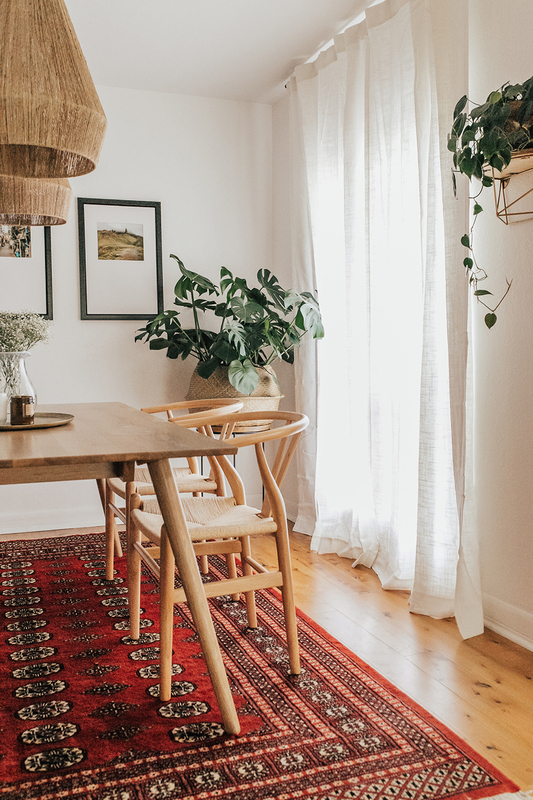 Our dining room has been in the works for over a year, and after making a few major adjustments (I swapped out our old table and chairs for the beauties in this post…but more on that shortly!) we finally had a few travel photos framed, potted our plants, put up some shelving and topped it off with statement light fixtures and some linen curtains. 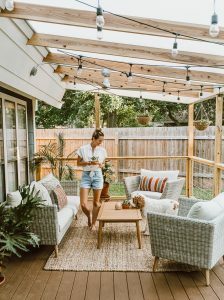 The overall vibe of this space is “modern bungalow” (….which is what I kept in mind as I shopped for pieces – I always like to use a “mood descriptor” to refer back to when buying items), and I think we totally nailed it! 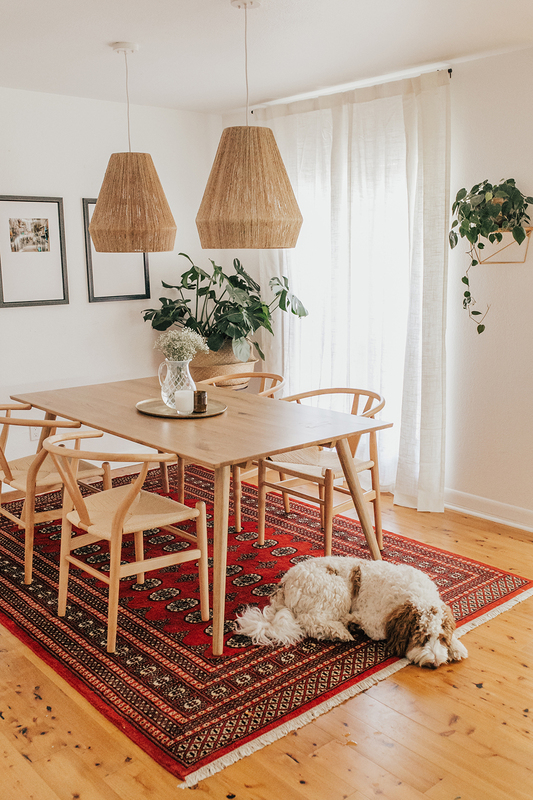 Well…at least it certainly feels cozy and calm with the rug, plants and wood combination, but with a modern twist given the mid-century look of the table and chairs. Needless to say, Blake and I are very happy to sip our coffee here each morning and chat about the day ahead. Ps. Watson was actually a total ham during this shoot – there were no treats involved, ha! He just willingly really wanted to lay on that freshly vacuumed rug haha! Hey friends! God bless your patient souls because I KNOW this post has been loooong awaited! I have this thing about showing “unfinished” renovations, when really, the unfinished stuff can also be pretty interesting, too (…it’s me in my own head, per usual)! Moving forward, I’ll be sure and show more progress-type photos/blog posts along the way. Constantly learning over here and I always appreciate your feedback so much! 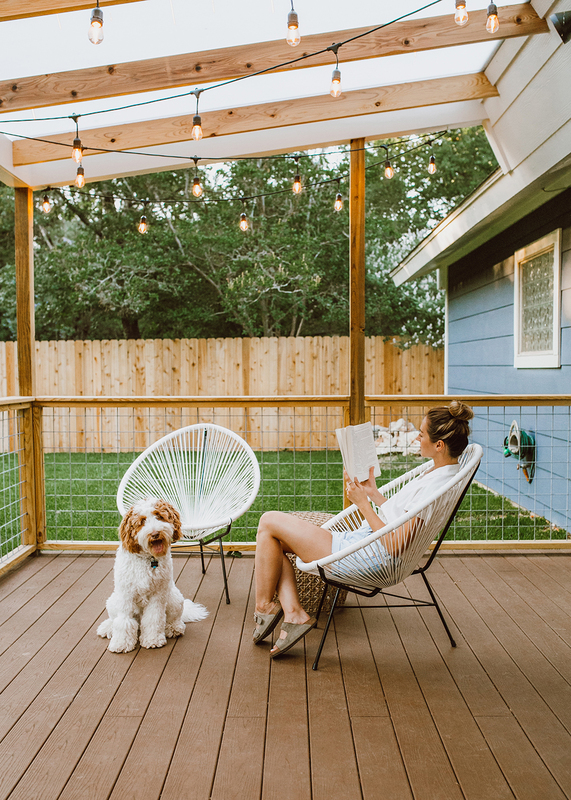 Sooo if you’re new to LL, we decided to do some serious renovating to the back of our house in February (you can refer to this post where I shared our reno plans). 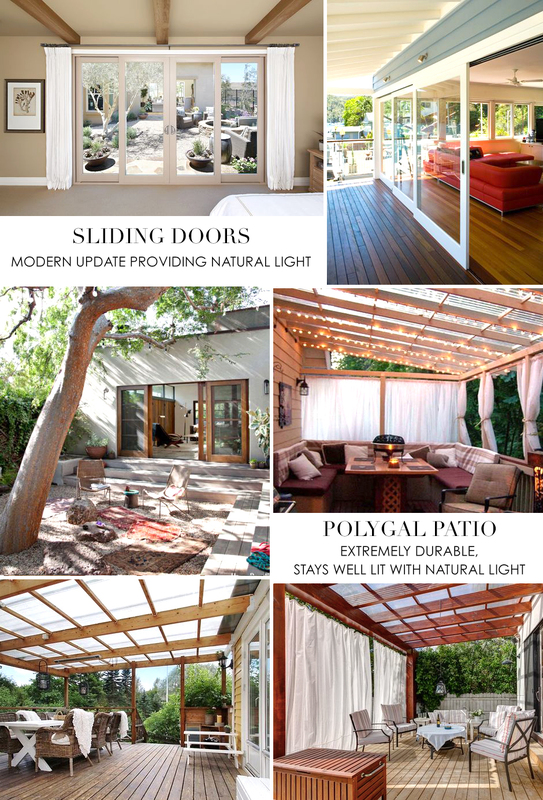 In a nutshell, we removed four paneled windows along the back of our house and installed custom floor to ceiling sliding glass doors. We added new siding (went for horizontal instead of vertical) and a fresh paint job, then added a covered patio (but opted for a polygal roof instead of extending our current roof to save the natural light). 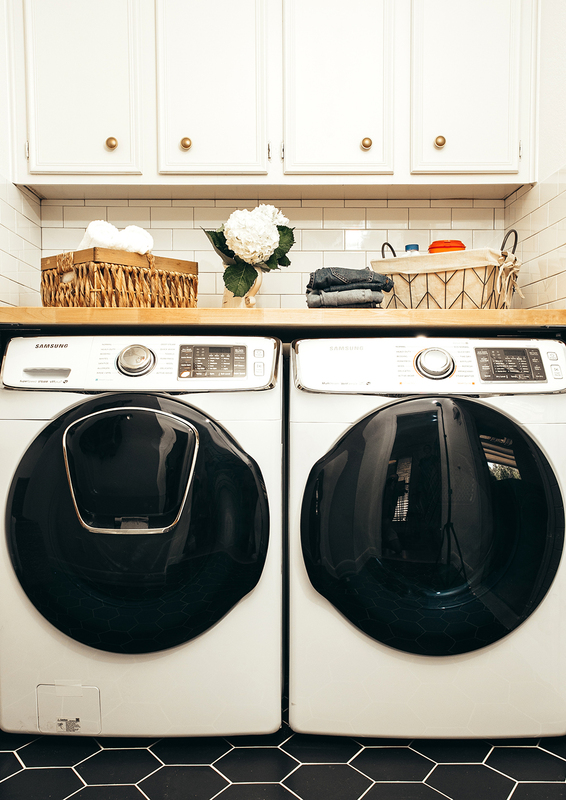 Given that this renovation was a big one, I’ve decided to break up “the reveal” into two separate posts because there’s just so much to share! 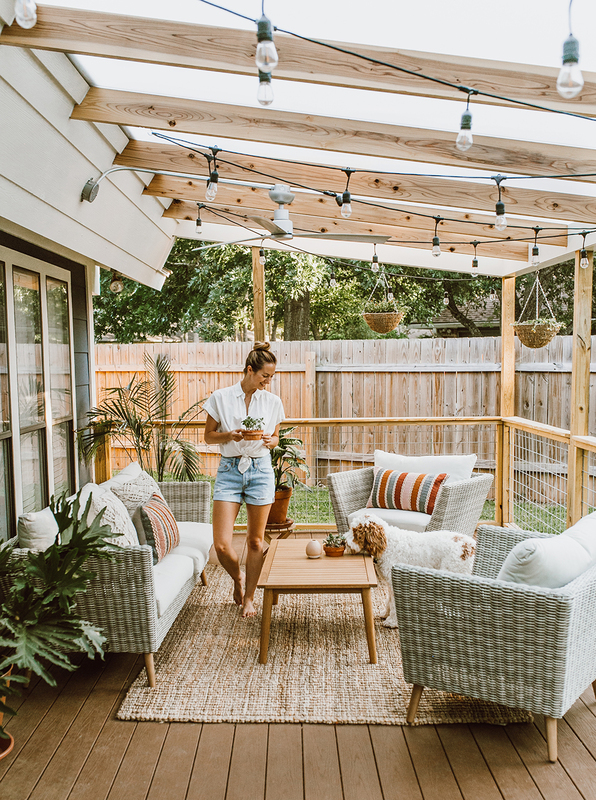 Thus, today we’ll focus on the outside patio and all the furniture details, then in a couple of weeks I’ll share some before/after snapshots from the inside of the house and (fingers crossed) share a video (!!) 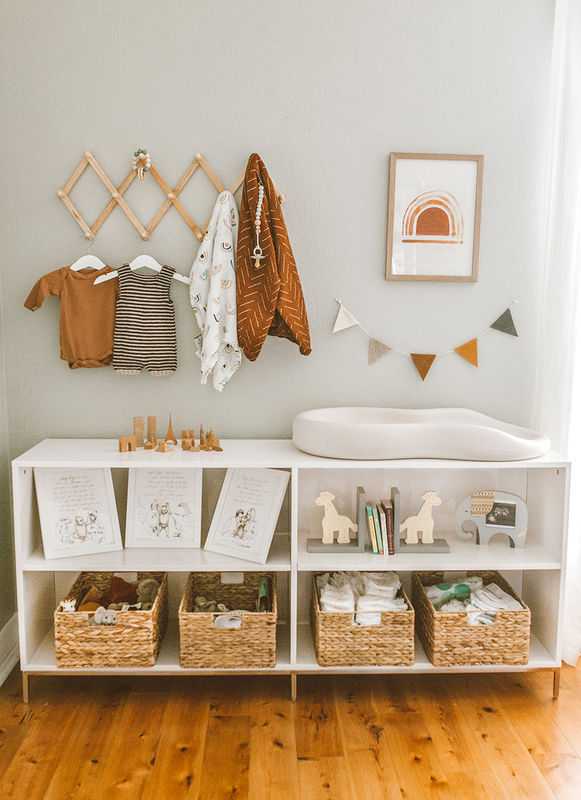 giving y’all a house tour from the inside out, while also sharing the materials we chose and why, who we used for contracting, etc. 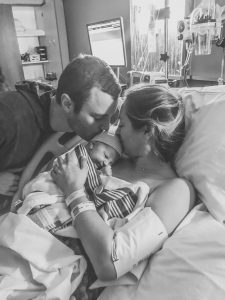 We learned a TON from this process and I am thrilled to share it all with you guys! You know you’ve become a true adult when the day comes that you’re excited…no wait…ecstatic for a vacuum upgrade. When the box for our new Dyson arrived on our doorstep, you’d think I was a wild animal opening up that package…but no, just a regular ‘ol girl who reaaaaally loves her cleaning gadgets! And the absolute best part? This fella was just over $200 (reg. $499)!! I have never seen so many beautiful (…dare I describe a vacuum as such?) 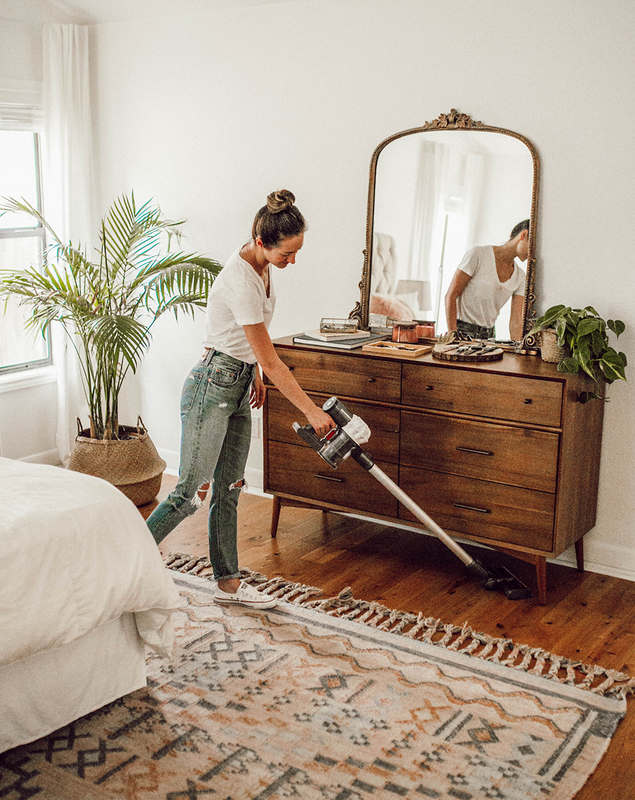 Dyson vacuums that are also SO affordable. And where oh where would you find such a deal? Look no further than eBay! A big thank you to eBay for sponsoring this post! As always, all opinions are my own. 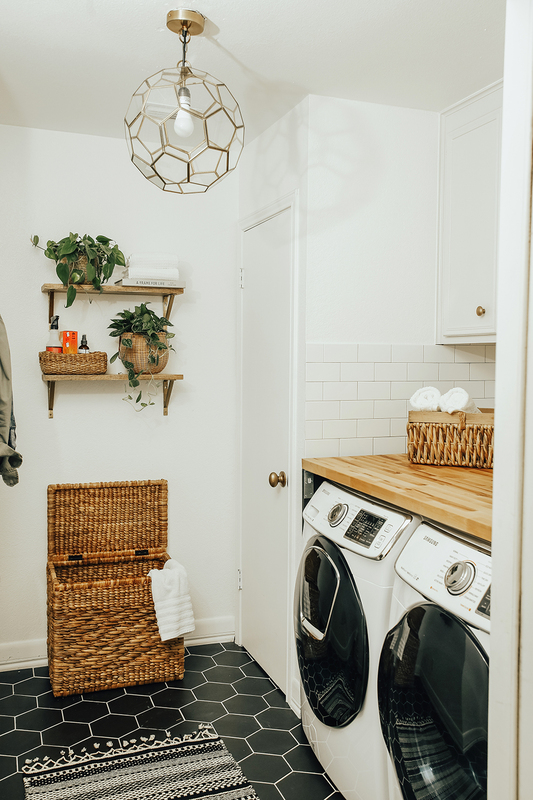 Before & After: Our Laundry Room Reveal! A big thank you to The Home Depot for sponsoring this post! All opinions are my own.